You will probably like this game if you like logic or puzzle games. 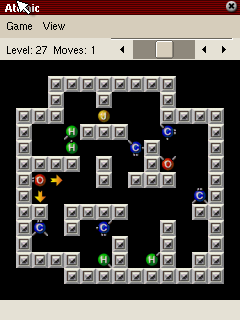 Atomic is a port of the well known KDE game katomic of the KDE project. The objective of the game is build up molecules by moving the individula atoms of the particular molecule into the proper positions. This is done in a labyrinth type game board. A level is one if a molecule is correctly set up. The Atomic game has a very nice and novel idea which is well implemented. Moving the atoms to build up molecules is a good and demanding logic puzzle which keeps you playing and trying again. The nice graphics and good handling of the game make it fun to play. There are a few problems, especially compared to the KDE version. Due to the smaller screen the target molecule is not visible at the same time as the atoms and you have to switch the screen. Also there is no highscore list which would motivate you. Also it can be argued whether it is an advantage or a demotivation factor that all levels can be selected at any time as independent games. A bit more thought into the game play, game design and game motivation would have made this an exceedingly good game but in the current version it is still very good and can be fully recommended.